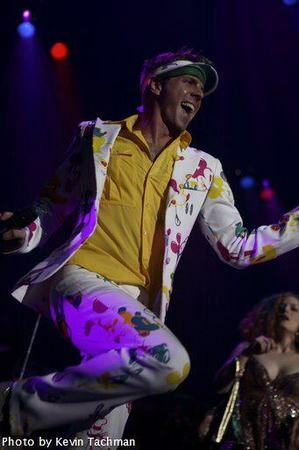 Scissor Sisters kicked off their Japanese tour last night at the Tokyo Zepp Theatre. Jake is wearing a Disney inspired suit designed by Zaldy. While they were in town, the group also shot the video for their next U.K. single "She's My Man" directed by acclaimed Japanese director Nagi Noda. The Scissor Sisters are always good for an interesting show. Loved Ta Da. So funky and dance-able. P.S. Gotta love Lily Allen! Taking a roadtrip to Detroit to see these guys in March. Completely stoked -- can't wait.